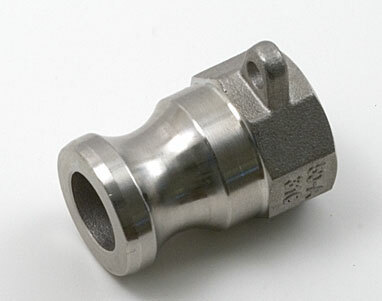 This Snaplock 304 stainless connector has 1/2" female NPT threads to fit Blichmann and Shirron Heat Exchangers, as well as the March Pump. Use this to make a quick connect fitting for your hot wort going to a pump or exchanger. This also fits the snap lock coupler on the outlet of the Robobrew Gen 3. These are the best QD I've found and the only ones I'll use now. Before, when I was using the "ball-lock" style, i was having issues with leaks primarily due to tiny differences in the fittings between manufacturers. Some fit super tight, some way to loose and some I had to send back because they wouldn't fit at all. With these cam-locks, Ive actually ordered them from several different vendors and every one has fit snug as it should and haven't had one leak. Not to mention that these are a fraction of the price of the "ball-lock" style. Highly recommended. And of course, Williams shipped fast and I received them in good order. These are really good Q.D. 's at a reasonable price. I use these on my pump. Hop Rocket and plate chiller. I LOVE all of the snap lock couplers and adapters. I am using this one on the inlet to my march pump and on the inlet to my chiller. Absolutely the best $5 you will spend in your brewery. Try these out if you use a plate chiller. I replaced my old fittings with the snaplock products and no longer cut my fingers on the stainless threads of my chiller. Will this fit the fitting on the mash and boil? Yes, this will screw onto the end of the valve of the Mash & Boil.